Synopsis (from the publisher): Paradise, Massachusetts, is preparing for the summer tourist season when a string of car thefts disturbs what is usually a quiet time in town. 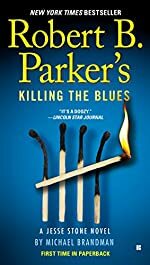 In a sudden escalation of violence, the thefts become murder, and chief of police Jesse Stone finds himself facing one of the toughest cases of his career. Pressure from the town politicians only increases when another crime wave puts residents on edge. Jesse confronts a personal dilemma as well: a burgeoning relationship with a young PR executive, whose plans to turn Paradise into a summertime concert destination may have her running afoul of the law. When a mysterious figure from Jesse's past arrives in town, memories of his last troubled days as a cop in L.A. threaten his ability to keep order in Paradise — especially when it appears that the stranger is out for revenge.